Her Majesty Raina the Queen Consort of the Hashemite Kingdom of Trans-Jordan, and a Palestinian by birth, has announced that Justin Trudeau, Prime Minister of Canada, is “a father, a feminist, a moral leader, a global citizen.” She was speaking at the Atlantic Council’s global citizenship awards in New York on Tuesday evening. As she presented the award bottle to Trudeau with a symbol of the world as a stopper, she introduced Trudeau as “the spirit that shines so very brightly in this northern star”. To help them swallow that, the audience was also presented by a commercial Canadian sponsor with glasses of another star spirit, Zirkova vodka. That turns out to be a Ukrainian brew which its owner, John Vellinga, called after the Ukrainian word for star, zirka (зірка). 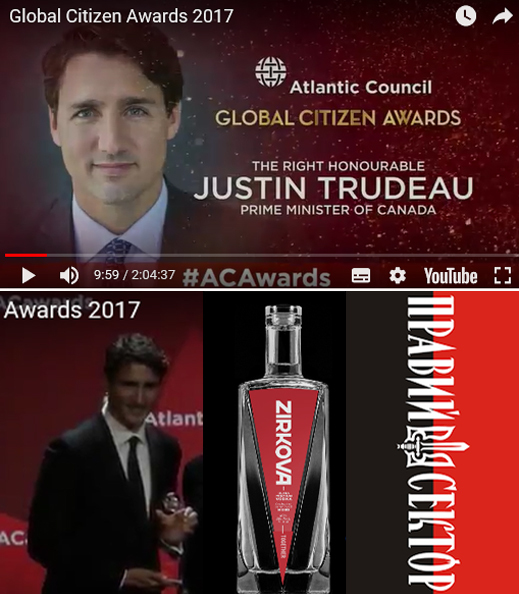 It’s also a brew for which Trudeau’s predecessor as prime minister, Stephen Harper, helped to modernize a distillery in the Ukraine, plus zero import duties on reaching the Canadian border, plus endorsement from the US-financed, Kiev-based investment fund Horizon Capital, created with State Department money by Natalie Jaresko, US diplomat turned Ukrainian finance minister turned US official again, and her protégé, a Ukrainian-Canadian named Lenna Koszarny. 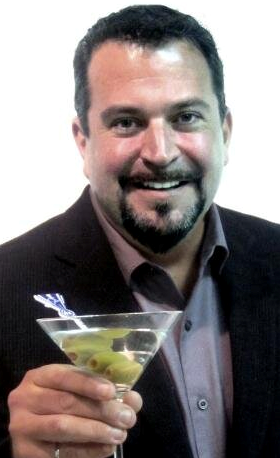 Zirkova is one of two vodka brands of the Multiculture Bevco company, which is owned and operated from Ontario by John Vellinga and his wife Katherine. Ukrainian-Canadians, their story is that “they discovered a gem of a vodka factory located in the Cherkasy region of Ukraine, the birthplace of vodka. The factory was built in 1896 in the village of Zolotonosha to take advantage of the perfect source of artesian mineral water.” Zolotonosha (Old Russian for golden cargo) is on a tributary running into the Dnieper River, 500 kilometres west of the Donetsk and Lugansk provinces fighting the regime whose government is in Kiev and ideological base in Lviv, 500 kilometres further west of the distillery. 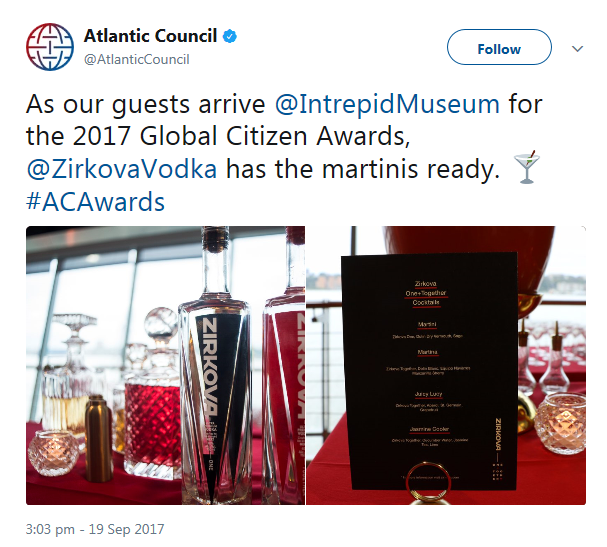 Still, vodka is the Russian word on the bottle, and in the history of the spirit, there is near-unanimity in non-Russian Europe that it was first produced in Russia in the 9th century; mentioned in Russian chronicles of the 11th century; and distilled in mass quantities by the 14th century. The Wikipedia compilation refers to an 8th century Polish variant but it was evidently a type of brandy. The Ukrainian claim doesn’t get a mention. Zirkova vodka and Multiculture Bevco received their start-up investment from Koszarny of Horizon Capital; that is according to this report. For the story of US and Canadian government funding for west Ukrainian businesses, read the Horizon Capital story under Jaresko here. For Koszarny’s role, with Harper’s contribution of $400 million in Canadian government funds, click to open. In a pitch Vellinga (right) made to Ontario investors in 2015, he mentions that he started the EBS consultancy in the Ukraine when he was living in the country. In her current Horizon Capital bio, Koszarny claims she “co-founded a leading consulting firm in Ukraine, EBS, in 1998.” Vellinga’s pitch acknowledged that the only demand for Zirkova vodka used to be the Ukrainian-Canadians. But in order to generate significant growth in demand, and the billion-dollar takeoff in brand value Vellinga and his investors are hoping for, Ukrainians aren’t the target. Instead, women aged between 19 and 30, who consume vodka in mixers and cocktails, are Vellinga’s objective. He is aiming at the time when, according to Vellinga’s industry projections, 70% of all vodka consumed in North America, and possibly in the world outside Russia, will be female.